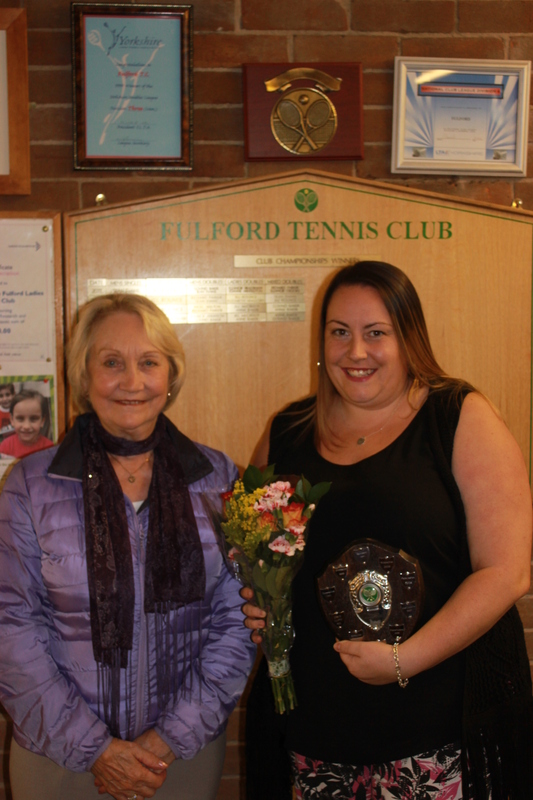 This season’s trophy presentations took place at Fulford tennis club last week. Bubwith 1 celebrated successive title wins by picking up the division 5 trophy. In the closest championship race, they took the title on games difference over Dunnington. Wilberfoss, who have just missed out on promotion for the last couple of seasons, secured the division 6 title and were the highest games scorers in the league. 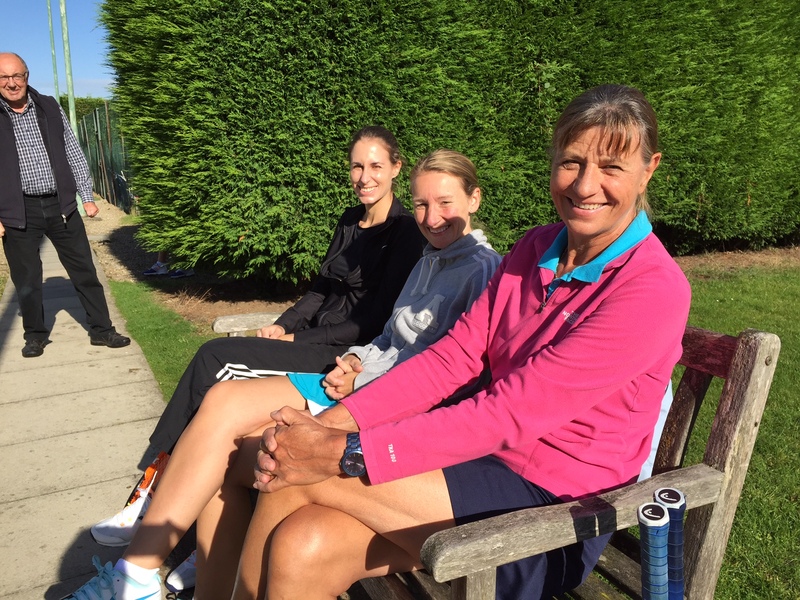 David Lloyd will move up with them after finishing the season with a six match unbeaten run. 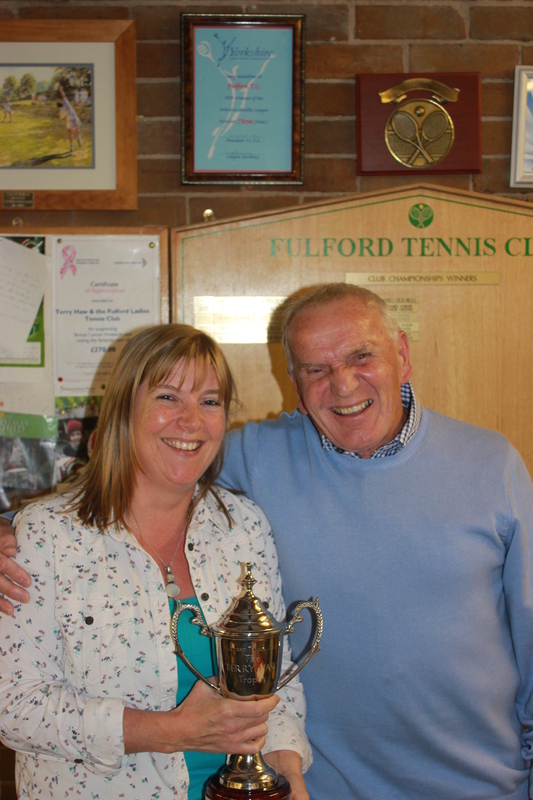 Fixtures secretary Pam Mason presents Wilberfoss captain, Gerry Screeton with the division 6 trophy. Wigginton claimed the division 3 crown, finishing just a point ahead of Cliffe. 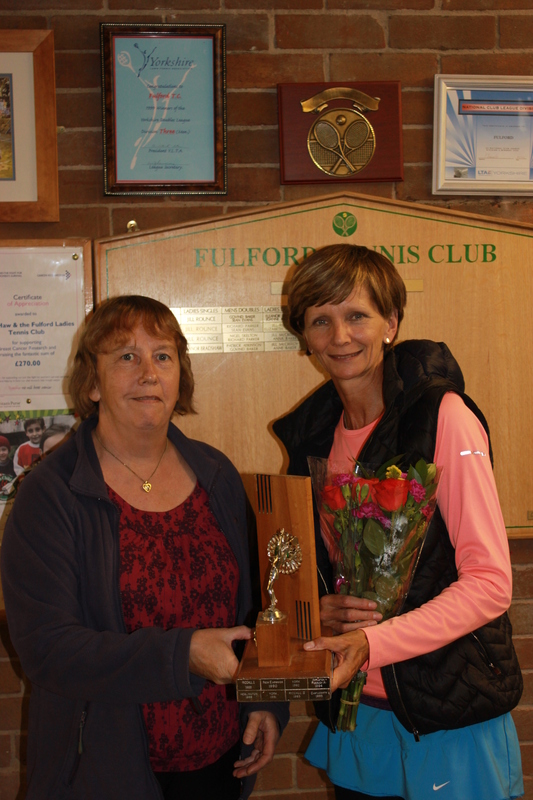 Beryl Bean presents Wig’s Lorainne Waudby with the division 3 trophy. David Lloyd will return to the top flight after just one season in division 2, claiming the title just ahead of Bishopthorpe who’ll join them in the top tier next season. 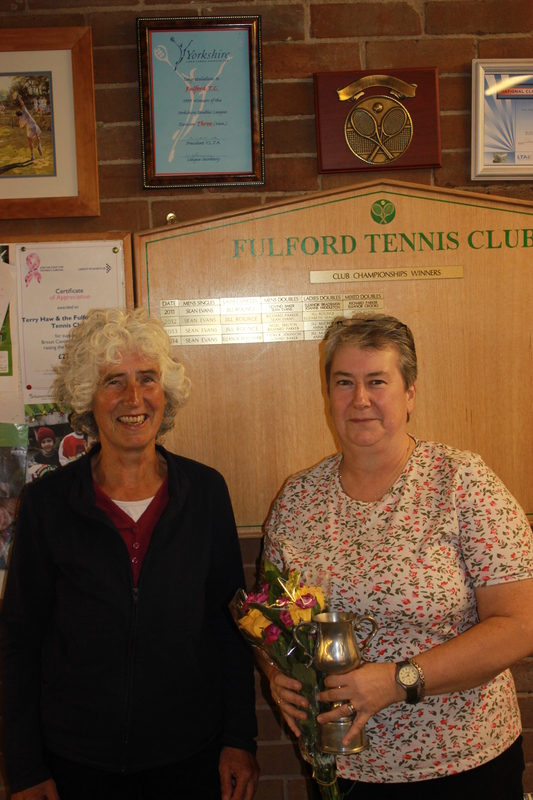 Jill McCreedy presents David Lloyd 1 captain, Louise Dwyer with the division 2 trophy. York 1 bagged their third division 1 title in a row and were the only unbeaten team in the league, Dunnington were runners up, losing only two matches to the champions. 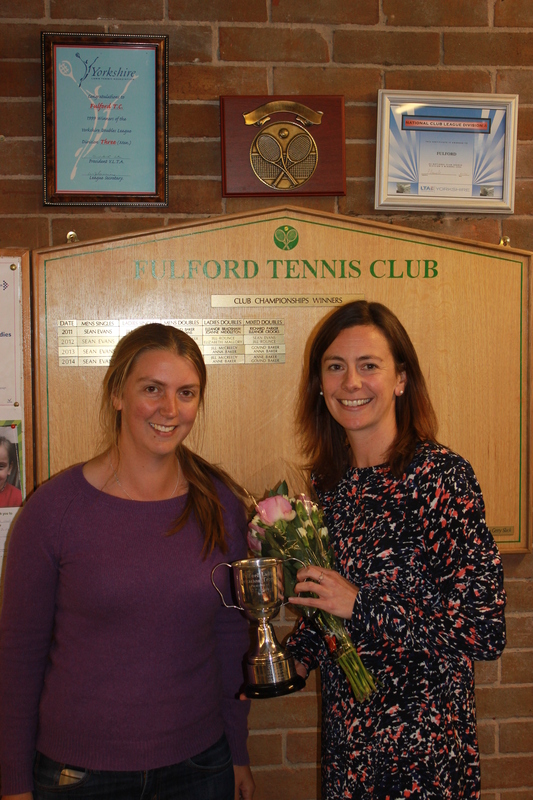 Results secretary Ellie Page presents York 1 captain, Kathryn Maude with the division 1 trophy. Each division’s top games scorers were recognised at the presentations. 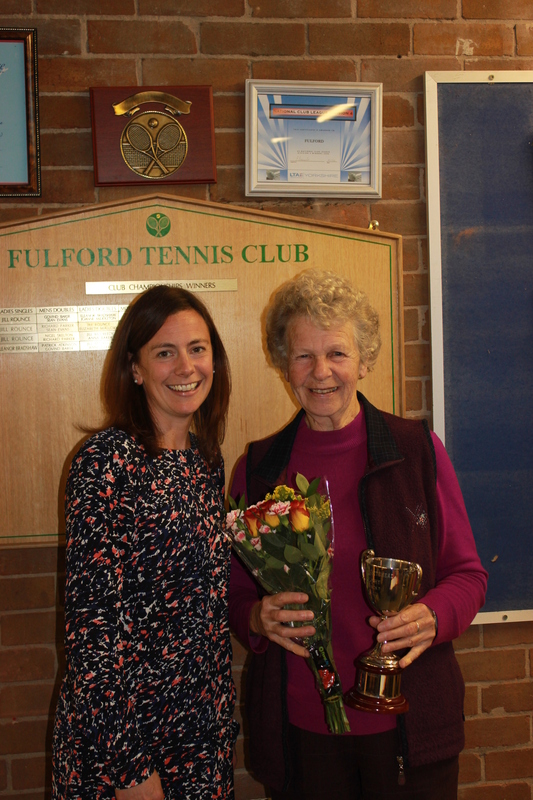 They were Wendy Stirke (York 1) 401, Sheila Dixbury (David Lloyd 1) 274, Denise Crane (Wigginton 1) 315, Sandra Jennings (Tollerton) 311, Liz Bramley (Bubwith 1) 318 and Michele Helm (Wilberfoss) 417. 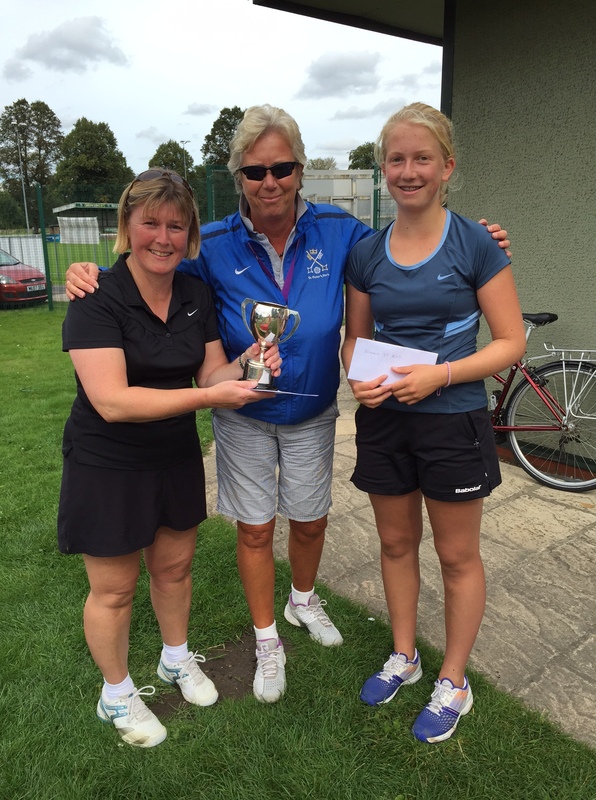 Michele Helm once again won the Terry Haw Trophy, given to the player that has won the most games during the season. Michele Helm from Wilberfoss once again won the Terry Haw trophy, presented to the player that won the most games throughout the season. 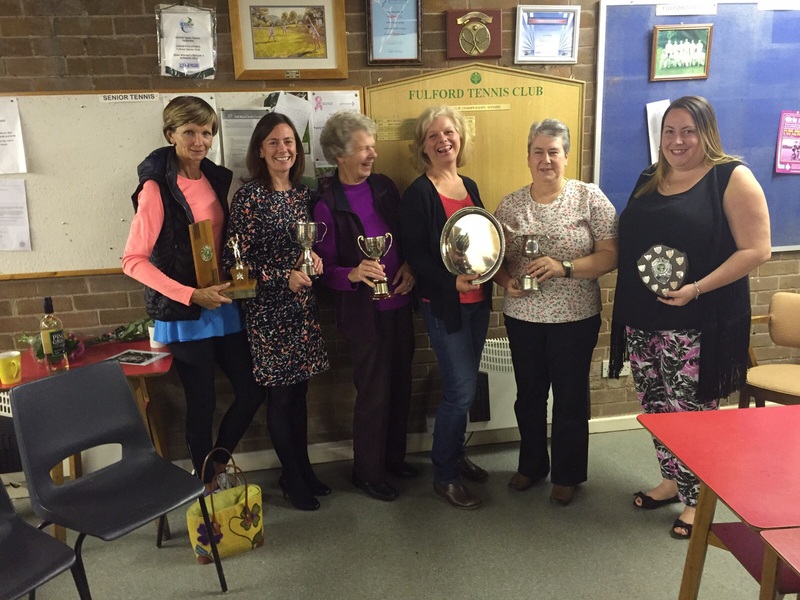 Dunnington 4 received the unofficial division 7 trophy, (as currently no division 7 this is given to the team that finishes top of the lower half of division 6, ie 5th!). They finished at the bottom last season so are on the way up! 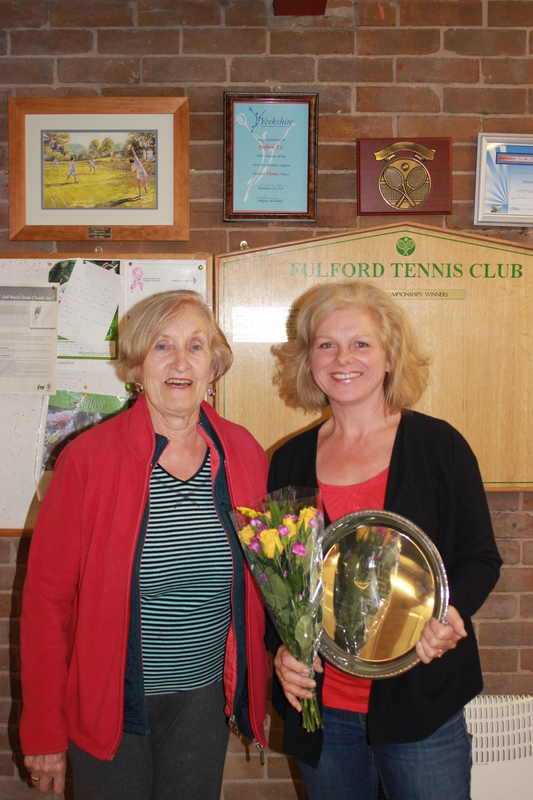 Kathryn Maude presents Dunnington captain Ann Murray with the division 7 trophy. 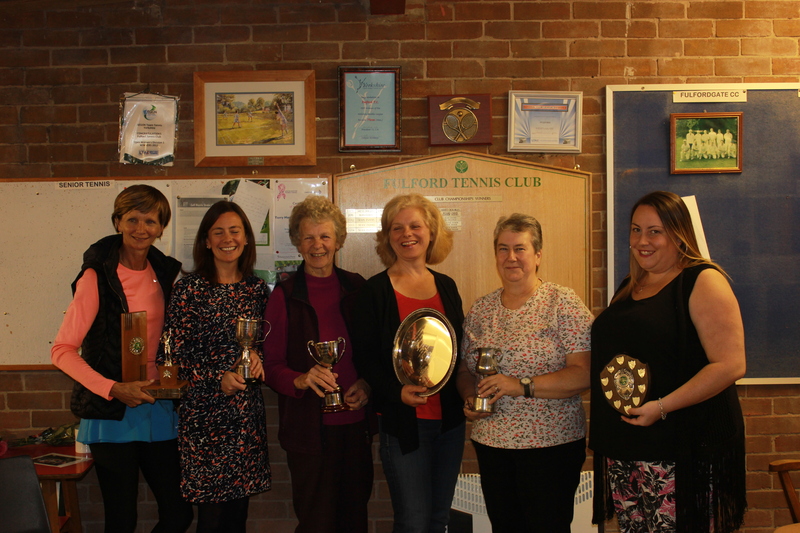 This season’s IT Sports ladies tennis tournament saw twelve couples from eight different clubs contend for the trophy, now in its 25th year. Players from divisions 1 and 2 of the ladies league competed in two groups with the top 2 couples in each group going forward to the semifinals. Group match highlights included Rufforth’s Kate Lewis and Sue Yoward’s tight 3-2 win over Bishopthorpe’s Jane Parkin and Fran Critchley; Fulford’s Jo Middleton and Wendy Wong’s comprehensive victory over team mates Wendy Cook and Pauline Craddock and host club, York’s Kathryn Place and Faye Chapman’s defeat of Starbeck’s Ali Wales and Christine Nodding. 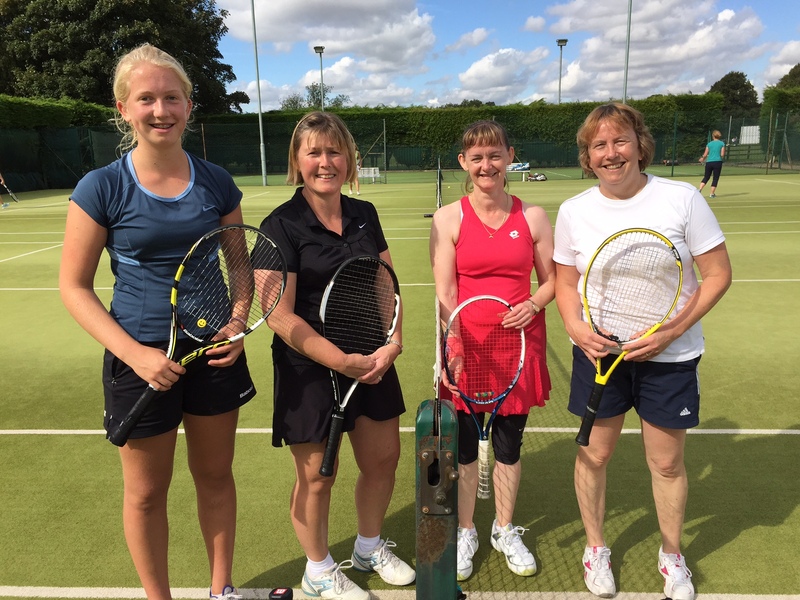 The first semifinal saw Pocklington mother and daughter team, Ruth and Rebecca Hill take on defending champions, Jill Rounce (Bubwith) and Jill McCreedy (Fulford) , who they defeated comfortably 5-2. 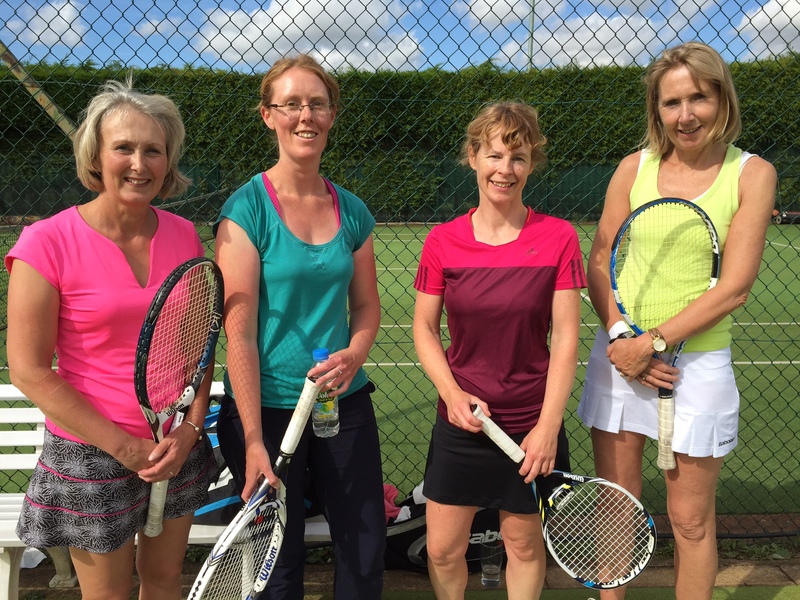 The second semifinal was an all York affair with IT debutant Jill Le Pla and former winner Siobhan Gilfillan overcoming team mates, Caroline White and Wendy Stirke. 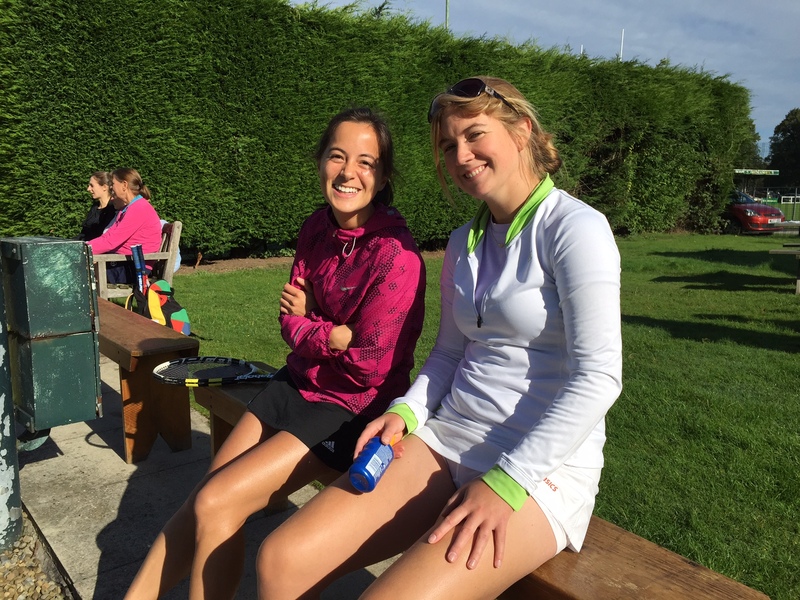 The final produced some stunning rallies with the hard hitting fifteen year old, Rebecca Hill being ably backed up by Mum Ruth. 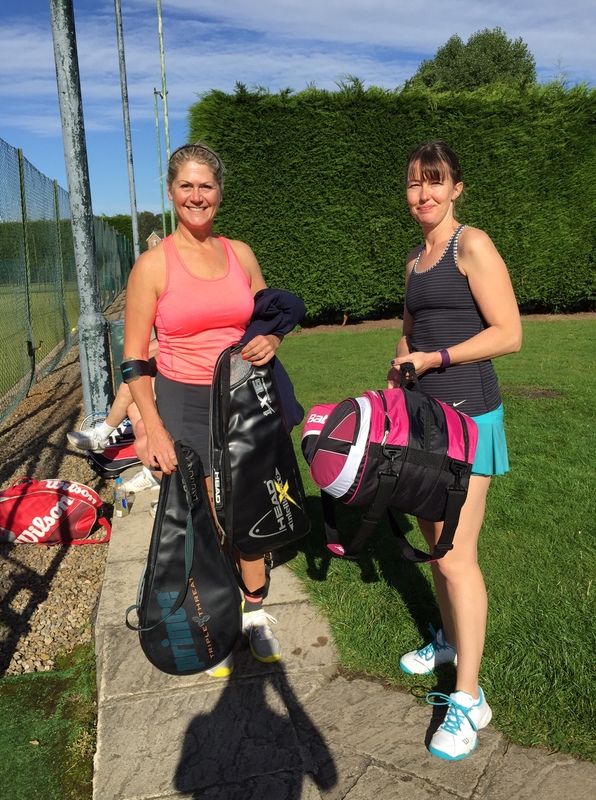 Left hander Jill Le Pla and Siobhan Gilfillan proved difficult opponents, matching and returning much of what came at them. The Pock pair eventually triumphed however, taking the set 6-2 and so lifted the trophy for the first time. 1ST SEMI – THE HILLS MEET THE JILL’S! 2ND SEMI – BATTLE OF THE YORKIES! 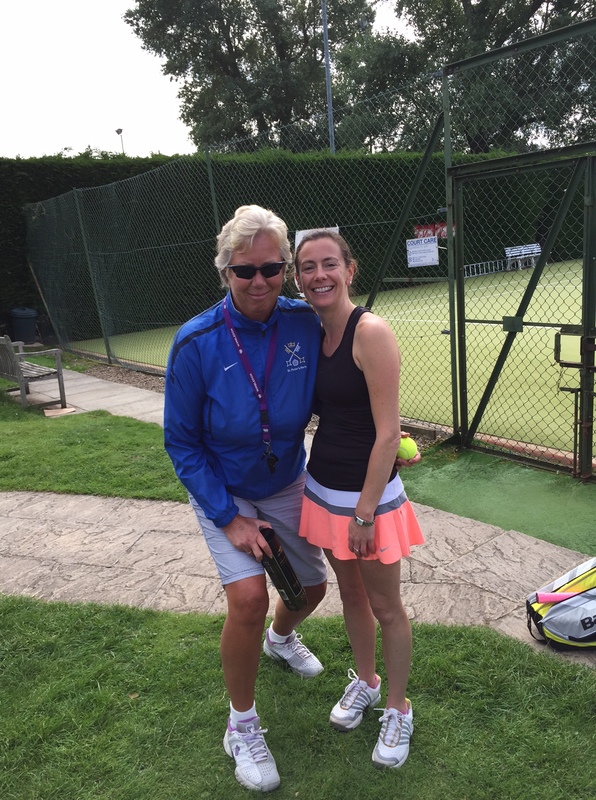 Tournament organisers, York Tennis Club, would like to thank all couples that participated and everyone that took part in the raffle, which along with entry fees raised £145 which will be donated to the research charity, Breast Cancer Now.